This essence is believed to throb with life and in all magick, like attracts like-so bring abundance, blessings, and fertility in your life with this! Use this on 7 color, 7 day, chupparosa, adam and eve, or goddess candles. 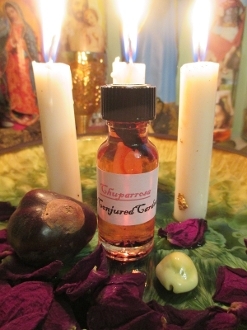 This oil is also loved by Oshun, Venus, and Aphrodite as well. Created with lotus, honeysuckle, sandalwood, and ylang ylang essential oils and absolutes.